Between Thanksgiving and Christmas, a lot of turkey is roasted and eaten in our house. If that sounds familiar to what happens at your house, or even if you just have a bunch of leftovers on hand from the holidays, this sandwich is the perfect way to change things up a little and still use most of the ingredients you likely already have in your refrigerator. Even though it's the end of November we surprisingly still have lettuce in our garden, so I like to pick a few leaves whenever I want to make these yummy bites. I adore the mini whole wheat bagels from Trader Joe’s because they’re inexpensive, healthy and Kenya craves them, but you can use any kind of mini bagel you find and love. These mini turkey sandwiches are the perfect way to make sure your leftovers are not left over for long! 1. Spread a teaspoon of mayonnaise on each cut side of the bagel. 2. Top with turkey, cranber-wee sauce and greens. 3. 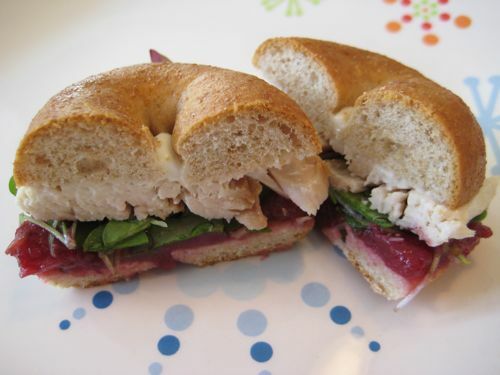 Top with other slice of bagel.